For Sister Joella Kidwell, leadership is something that can’t be earned or bought… it’s a God-given ability to change lives and lead people to successfully accomplish His vision and mission. Most of us learn as young children how to follow directions. However, those who take initiative stand out from the crowd – not because it’s about doing what you’re told, but rather finding new ways to get things accomplished. REALM: When you were first called to leadership in the Sister’s Senate, what did you do as the president of that group? JK: The priest who was the administrator of the diocese at the time (we were between bishops) wanted to consult with the sisters who were working in the diocese. The only group that had membership from all the eight communities represented in the diocese was the Vocation Committee of which I was a member. We would often be called and asked what we thought about certain things. However, we had not been appointed to this committee to represent our respective religious communities, but rather our focus was to work together to promote vocations. At the time there were sister’s senates being formed in other dioceses, so we suggested to the diocesan administrator that he form a sister’s senate whose membership would be appointed by the leadership of their respective communities. This was during the immediate post Vatican II days, so there were many changes happening in communities and in the church. That is how it got started. I became the first president when I was quite young – I was in my early thirties at the time. I did not know enough to really be scared. I enjoyed the challenge. As president I was able to attend a couple of national conventions that gave me some exposure to what was going on in the bigger picture of religious life and the church. Some of it was very confusing at the time. Over the years, I have found that when you say yes to one thing, other opportunities seem to show up and you just continue to say yes. I was often the first person doing some new kind of thing (i.e. 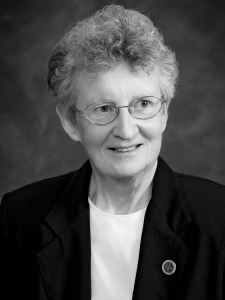 first president of sister’s senate, first woman vocation director in our diocese, etc.) Saying “yes” has gotten me to London, Rome, Ireland, Africa, and even Tonga. Wonderful opportunities and enriching experiences! REALM: What were some of the challenges of leading women who represented different congregations? Was it easier than you thought it would be? JK: One of the challenges at the time was that communities were in different stages within the renewal process. The structures had all been set in stone for ages and then everything was up for grabs. There needed to be a real sensitivity to the differences in communities – especially in terms of what their thoughts were in response to the renewal that was happening in the church and religious life. Even individual sisters on the committee were in different places and their superiors and community members might think very differently. We had to be very careful (almost political to some extent) or at least be very sensitive to all the issues that were involved before determining how to move forward. For example, I remember a newspaper interview in which most of us responded very honestly. Of course the reporter had her own understanding of what was said. All of us learned a lot about what not to do in an interview with that experience. REALM: How did you develop that skill of being sensitive to the differences? JK: Maybe it came out of my childhood…just standing and watching and realizing what the other must be feeling. Growing up without a mother, I had lots of questions and no one that I felt comfortable asking. I often felt out of place or like I did not fit in. I knew what it felt like. In school there was a girl who lived down the street from us, and the family’s house was not in very good condition. I remember thinking we should walk home with her because she could really use a friend – even if it meant losing my friends. I could feel her pain. REALM: What were some of the things that you took from the facilitation training that you continue to use today? JK: It is hard to put into a few words what I learned through various training experiences. Basically, I learned the difference between process and content. I learned to design a process that would help the group move toward the goal of that particular meeting. I learned how to think about meetings and prepare for them. I became aware of how to translate the concepts of discernment into a more business language and to help a business group move deeper into the interpersonal and even faith dimension of what was happening in the group. And I learned something from every group that I facilitated and from every facilitator I experienced. I learned how helpful group feedback can be. I am so very grateful for the many men and woman both lay and religious who taught me. REALM: What else did you do to assist your sisters to move from what they felt was “comfortable,” and that no longer served them, and make important decisions for the future? JK: During my time as prioress in my community, it became obvious that our mission in Guatemala was no longer a viable community. It was my task to help the small group in Guatemala realize this and to communicate to the founding monastery back home so that a decision could be made about its future. It was a very emotional decision for all concerned. In the end, we succeeded in getting another Latin American community to take over the mission, and to re-settle the sisters involved. While it was a very sad and difficult decision, I felt it was something that had to be done for the good of all concerned. Because we were able to get another group of sisters to take over the ministry, we still have a relationship with the ministry. REALM: When you were called to be president of the federation, what skills did that take? JK: There were some issues in member monasteries that needed to be addressed, and the facilitator asked those of us who were candidates to share some of our past experiences. Recently, I had worked with a congregation of sisters who had ten large houses located across the middle of the U.S. that had at one time been motherhouses. They had made a decision at their provincial chapter to downsize and to look at alternate living arrangements and management of ministries in each of these places. In some of the houses there were small groups of sisters getting old and rambling around in great big buildings. Their leadership and I designed a process and visited each community to help them look for options. I think I was elected because we had some very similar situations in our federation. The skills that I had used and the experience that I gained in helping address the issues of the congregation, were very helpful. REALM: If you look back on your leadership, what three things would you do differently? JK: I would probably try to take better care of myself physically and mentally. When I was Prioress, I met with a counselor on a regular basis. That helped, but I think I also would be a little bit more aware of what kind of complementary assistance I needed to serve well. Someone who could not only help me, but someone the community would see as helping them. I would hope that I could be more patient. Not everyone can think or move as fast as I would like. I would hope that I could better pace myself and allow the community to move at a more manageable speed. Because of not having an adult on which I could depend on as a child, I tend to keep an emotional distance from people. It is a survival skill that served me well as a child, but gets in the way when as a leader, I need to be with an individual who is experiencing times of emotional weakness.